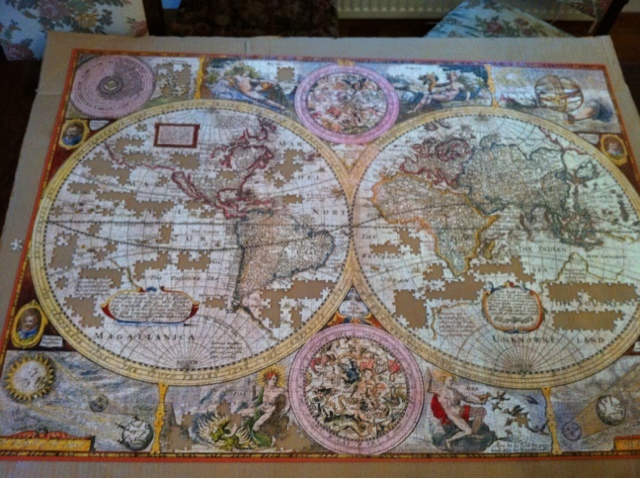 Since Christmas an enormous jigsaw puzzle has resided on our dining room table. 3008 piece enormous. On the box it says 3000 pieces, but when I opened it up, sitting on top of the jumble of minute jigsaw shapes was a small notice reading in several languages: Note: due to technical reasons this 3000 piece puzzle actually contains 3008 pieces. I considered returning it right then and there. 3000 pieces, yes, but 3008? That’s pushing some limits, I’m telling you! 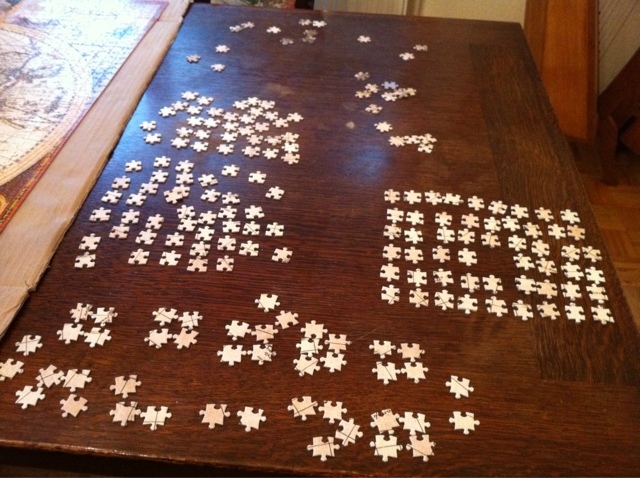 We began the puzzle early in January in those hazy post-Christmas days. I like a jigsaw puzzle going in the winter to gather the family ‘round and promote camaraderie ‘gainst the dark nights of winter. Or at least I like the concept. The fact is, despite the strong efforts of the more dedicated puzzle do-ers of the family, a 3008 puzzle is just really big. And full of pieces. And takes a loooong time to finish. But…piece by piece, the picture began to take shape. It’s a picture of an old map of the world, back in the days of exploration when things like Canada were still a bit sketchy and over the general area of Australia and Antarctica is written in large black type “UKNOWNE LAND.” I love old maps – what promise and danger those days and maps held! So anyway, every day a few more pieces. And remarkable as it seemed, slowly the pieces added on tipped the balance and there were more pieces on the table than there were left in the box. 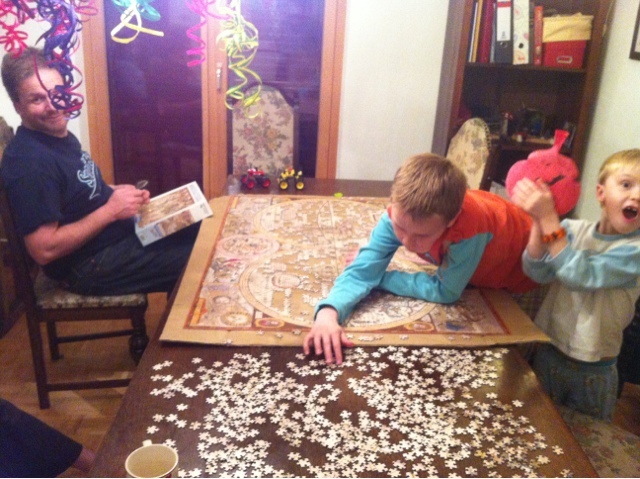 And somewhere along the way it seemed that the puzzle was a metaphor for a year of homeschooling. Round about late January, a year of homeschooling also seems like an insurmountable puzzle. Will our efforts ever take us anywhere? Will it really amount to something if we do spelling lesson 12 today? And I thought. Yes. It does matter. Everyday a couple more pieces in the puzzle and eventually the pieces add up. Bits of learning, however small for each day, add up to the point where the pieces on the table, or already under the bridge, to mix lots of metaphors, are more than those left to go. So this morning I prayed with the boys for courage for the day, for motivation to put a few more pieces into our education, and mid-prayer it occurred to me that maybe at the end of our homeschooling year, when all the pieces are placed, we’ll finish with a beautiful map of the world! And all the confusing bits that confounded us, like the piece with a top of a capital ‘A’ that turned out to actually be the top of a ‘U’ will make sense. Wouldn’t that be wonderful? Or maybe we just get that map when we’ve put in all the pieces into the puzzle of our lives. Or maybe we don’t get to see the map at all. Maybe we’ll only see the big map when we get to heaven. Maybe when we take our leave of God’s green earth all the puzzle pieces will still look like a big jumbly mess in the box. I seem to be living long enough to see that things here don’t always finish up tidily. Not everyone gets the time to place all the puzzle pieces. I don’t know. But I find that I can’t help always looking and hoping and trying to understand the metaphor. In the meantime…we are almost done and I’ll get soon my dining room table back, and we’re also almost to the point where we can see the end of the homeschool year, off there in the golden hazy distance. So until then…as Noelle's auntie would say, it’s Late Nights with the Puzzle. Somebody's getting a little OCD with the remaining pieces. That looks like a fun puzzle! And I needed the words on homeschooling - thank you.